Are you looking to build a WordPress website that truly converts? From A/B testing to capturing email addresses, the following 10 WordPress plugins can help improve your website’s conversion rate. When somebody says “SEO”, you want to dive into the deep ocean. For new and even experienced marketers, Search Engine Optimization is like a deep ocean. There is no doubt that SEO is a “holy grail” of lead generation strategies, and it can sometimes be difficult to execute without the right tools. 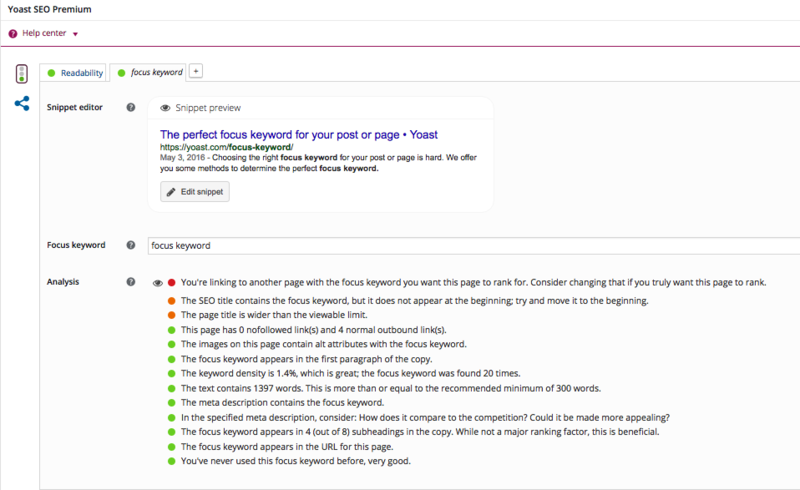 Yoast SEO is a WordPress plugin to help you optimize each of your posts with a handy checklist. The plugin helps you get maximum out of your website SEO with the help of straightforward XML Sitemaps, content analysis, breadcrumb navigation, snippet previews and shows you website performance against search engines. The WordPress Local SEO plugin helps your website ? in local business listing and increase local search ranking. The plugin helps in optimizing local listing and ensure that your website has a consistent listing in more than 50 websites. The plugin will empower you with a handy keyword research tool, competitor keyword spy tool and suggest you with the appropriate content submission websites to increase your local search visibility. Your website analytics matter to you and you don’t want to spend days trying to read and analyze the data..
Thankfully, I have some good news for you. Checking your website statistics were never as easy as it gets with MonsterInsights. It’s a Google Analytics plugin for WordPress, which clarifies your website statistics right on your dashboard. Install this plugin in your WordPress environment and get rid of leaving your website to check analytics. Now you can stay on your website for all the analysis and write your post without getting distracted. Pro tip: If you decide to install this plugin, make sure your Google Analytics isn’t being tracked twice after installing Monster Insights. If it is, you’ll have to choose between verifying your Google Analytics with Monster Insights and your preferred method, whether that’s hard-coded or through Google Tag Manager. Writing a proposal to book an appointment and then spending hours proposing, rejecting and rescheduling appointments can be a daunting task. It’s time to get smart about your appointments. How about a smart tool that can sort-out all appointments on its own? Yes, there is a smart solution Easy Appointments, a plugin will help you and your readers to book an appointment right on your WordPress website. It is easy to use with multiple locations, services, and workers. The plugin is a handy tool with extremely flexible time management. Get notified with an email when someone scheduled an appointment from your website. Now you have sorted out the best performing page on your website and you want to make it highly conversion optimized. Conversion rate optimization (CRO) is a strategic and time-consuming process. Also, you want to make sure that your website is giving the best user experience to visitors. The plugin helps in building compelling landing pages and opt-in forms to attract more subscribers or leads. Use gated content (online courses, help guides or strategy roadmaps, and webinars) to skyrocket engagement and conversions on your website. It’s challenging to run CRO without hampering user experience. Thrive Leads is a handy tool with a range of CRO options to generate leads easier, smarter and faster. You really want some action on your website? Your website success depends upon the success of CTA buttons used on your site. Inbound Now help you in creating CTA for your site. Inbound Now allows you to create and customize templates, run A/B tests, and monitor the statistics. The plugin will spark the ‘AHA’ moment. Download and install Inbound Now on your WordPress site and start converting your visitors into prospects and prospects into your customers. Create actionable CTA and start growing your business. People usually gets distracted and feels annoyed when a pop-up opens on your site. Both are important for your business- creating better user experience and lead generation. Therefore, you should use Hello Bar- a smart way to increase leads on your website without annoying your website visitors. Hello Bar easily integrates with MailChimp, Campaign Monitor and Aweber. It also includes all the social media follow buttons. If you want to create a better user experience on your website while collecting more leads, then implementing Hello Bar on your website header is recommended. As a site owner or marketer you’re always in a quest to find better lead generation opportunities. You want to have an easy tool to create better landing pages that boost your lead generation efforts. Unbounce is an expert tool to build customized landing pages, which you can easily publish on your WordPress website. More interestingly, you’ll be able to manage all your pages from the plugin. Moreover, you’ll be able to customize the landing pages to match your brand perfectly. Implement this plugin on your WordPress site and start creating compelling and action-oriented landing pages to your WordPress site. You want your website’s visitors to have the best experience possible, right? Well, then your website should be able to load faster so that your visitors no need to wait. As your website grows, you’ll need to add and update content which can increase your page load times. Waiting for a web page to load is frustrating for users and chances are they’ll leave your website before it finishes loading if it takes more than a few seconds. WP Super Cache is the plugin that makes your website load faster by producing static HTML files for non-logged-in users. Get this plugin for free with easy installation and configuration. Easily customize as per your need and you can make it work in sync with your Content Delivery Network (CDN). As a website owner you always want to improve your website for better user experience and business. In this quest, you need to run experiments to make your website better for users. Optimizely allows you to create and run experiments without logging in to your website. It’s easy to improve your site by performing A/B testing for each part of the website including headlines, CTA, and another part of the website. It easily integrates with heatmaps and you’ll get a detailed analysis of user behavior on your web pages. Start personalizing your website to deliver exceptional user experiences. Improve your website speed and performance through A/B testing and start converting your website visitors into customers. These are the top WordPress plugins to create a better user experience on your WordPress website. Now you can put your knowledge into action and start implementing these plugins to create a better website experience for your users. Delight your users with better experience on your website and you’ll be able to churn better business through. Author Bio: Nick is the head of marketing at WebbyMonks – An agency specialized in WordPress development services, helping business across the globe to grow their visibility online. When not writing for technology, he spends his time fishing, clicking awesome pictures and digging into the mankind history. Feel free to connect with him on Twitter & LinkedIn.